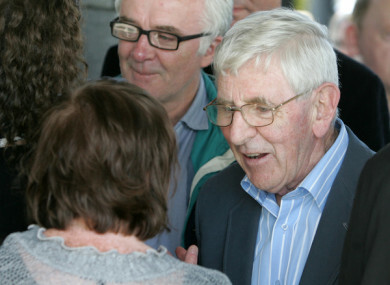 Dónall Farmer pictured at the funeral of Glenroe actor Mick Lally min 2010. IRISH ACTOR DÓNALL Farmer has died aged 81. Dónall was widely known for playing the priest Fr Tim Devereux in RTÉ’s long-running drama Glenroe. Originally from Blackpool, Co Cork, Dónall first joined RTÉ Television in 1964. He was sent to the BBC for training as a producer and a director and went on to direct over 50 episodes of 60s and 70s soap opera the Riordans before becoming Head of Drama for RTÉ in 1971. He was most known for playing Fr Tim Devereux on Glenroe, which ran from 1983 to 2001. Dónall also acted in many theatre plays, radio dramas and TV roles in both English and Irish. He was twice a winner of a Jacobs Radio and Television Award. He was also a former member of the Abbey Theatre and helped found the Everyman Theatre in Cork. Email “Dónall Farmer - who played Fr Tim Devereux on Glenroe - dies aged 81”. Feedback on “Dónall Farmer - who played Fr Tim Devereux on Glenroe - dies aged 81”.